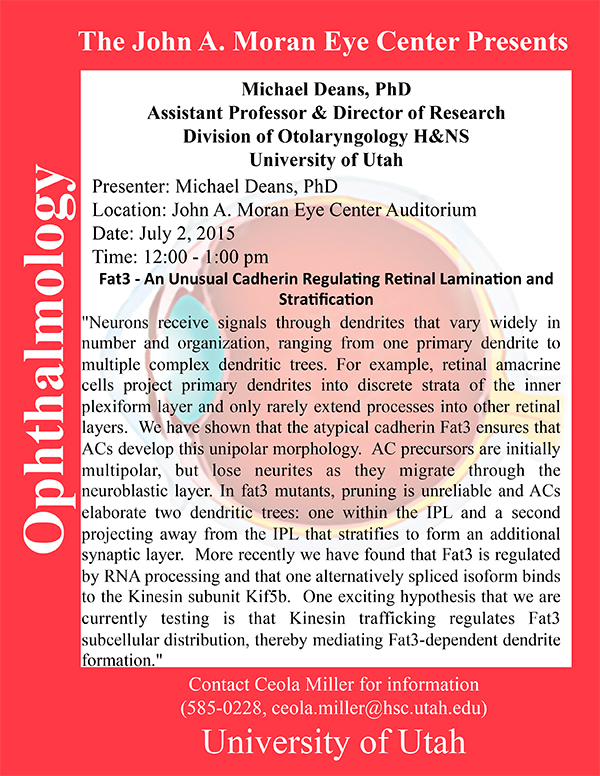 Michael Deans, Assistant Professor and Director of Research, Otolaryngology, University of Utah will be delivering a seminar on Fat3 – An Unusual Cadherin Regulating Retinal Lamination and Stratification on Thursday, July 2nd 24th at Noon in the the Moran Eye Center auditorium. Abstract: Neurons receive signals through dendrites that vary widely in number and organization, ranging from one primary dendrite to multiple complex dendritic trees. For example, retinal amacrine cells project primary dendrites into discrete strata of the inner plexiform layer and only rarely extend processes into other retinal layers. We have shown that the atypical cadherin Fat3 ensures that ACs develop this unipolar morphology. AC precursors are initially multipolar, but lose neurites as they migrate through the neuroblastic layer. In fat3 mutants, pruning is unreliable and ACs elaborate two dendritic trees: one within the IPL and a second projecting away from the IPL that stratifies to form an additional synaptic layer. More recently we have found that Fat3 is regulated by RNA processing and that one alternatively spliced isoform binds to the Kinesin subunit Kif5b. One exciting hypothesis that we are currently testing is that Kinesin trafficking regulates Fat3 subcellular distribution, thereby mediating Fat3-dependent dendrite formation.